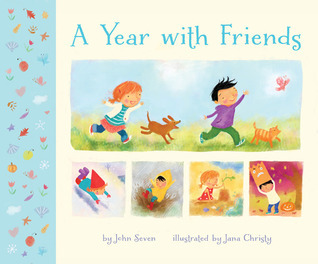 Two friends celebrate what makes each month so special! This husband wife, author illustrator team have done an exceptional job of portraying the months of the year in a simple sentence description that shares what young ones thoughts would be! "January is a time for rolling down hills." "June is time for bugs." The combination between words and illustrations really make this book work well for non readers to 'read' the story. A great way to introduce preschoolers to the months of the year with a visual stimulus of what each month holds! I am giving away my review copy of this book as I think it is a great one to share with my readers!